I love these chocolate ice cream sodas. They are a perfect old fashioned summertime treat. Not only that they are quick and easy to prepare and my kids love them. 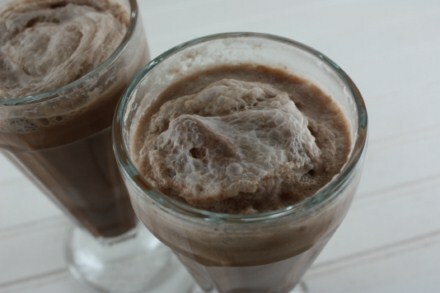 Have you ever made Ice Cream Sodas? Place milk, chocolate syrup, and chocolate ice in a glass. Add seltzer water to fill up the glass. Be careful this will fizz and bubble over if you are not careful. Chocolate Sodas are such a classic! You’re look delicious. I hope you will link up to No Whine Wednesday – you have some great recipes! Heavenly looking! And oh so tempting! This post took me back to my childhood! I remember my aunts and uncles taking me to get chocolate sodas! I haven’t had one in ages. I’ll have to make myself one soon! Sounds easy and very yummy! I love having this recipe for chocolate soda. It looks not only delicious, but refreshing. Thanks! My kids would go crazy over these. Although I make milkshakes and smoothies, I have never made a chocolate soda. I think it’s about time I changed that.